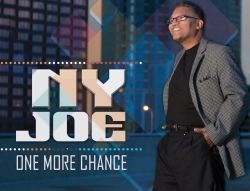 New York-Style Salsa Artist, NYJoe, Releases First Single "One More Chance." Live Concert with Big Band on November 18 with Portion of Proceeds Going to Puerto Rico. Nuyorican Salsa artist “NYJoe” releases his first single “One More Chance” worldwide and performs live on November 18th at the Cuban Civic Club in Tampa. This social event will feature live Salsa, Bachata and Merengue music, dancing, and food. A portion of the proceeds from this event will be donated to a Puerto Rico Relief Efforts at the wake of Hurricane Maria. Tampa, FL, October 10, 2017 --(PR.com)-- New York-style salsa artist “NYJoe” releases his first single “One More Chance” worldwide on September 22, 2017, ahead of the live presentation at his social event on November 18th at the Cuban Civic Club in Ybor City. This single acts as a precursor to his full album which is set to release in Spring of 2018. NYJoe recorded this English salsa with his arranger, producer, and Grammy award winner, Lannie Battistini. The single was recorded under Battistini’s music label, Hands In Motion Music Productions. This social event, hosted by NY Joe, will be filled with live salsa, dancing, and food. The first 50 guests will receive a free copy of NY Joe’s debut single “One More Chance,” and an event t-shirt. The $45 tickets will include a buffet catered by Las Margaritas Restaurant and parking. Guests will be able to enjoy a variety of music from artists like DJ Rumbero Ray and La Dama Del Swing. Special presentations will include a live painting by melodic artist, Izzy Gonzalez, and a performance by NY Joe and his orchestra "Son Tropical." The night will also include a special performance of NY Joe’s new single “One More Chance.” A portion of the proceeds from this event will be donated to a Puerto Rico Relief Fund at the wake of the devas. Jose “NYJoe” Narvaez was born May 1965 in New York. Growing up Joe was surrounded by music, mainly that of his famous uncle, Bobby Rodriguez. By the age of 15, he began touring globally with his uncle’s band Bobby Rodriguez Y La Compañia as a band boy. He would set up the sound equipment and perform sound checks; and occasionally he would join them onstage for background vocals. This experience not only influenced the sounds in his own music, but also pushed him into recording his album which will consist of eight new arrangements for both his original and cover songs. Most songs will be in English and cross over into Spanish in some verses. NYJoe is currently the lead singer for his own 12-piece band “Son Tropical,” as well as the owner of an entertainment company “Tropical Jam Entertainment.” For the last 5 years, his big band, Son Topical has been performing in the Tampa Bay area for private events, as well as, public concerts.